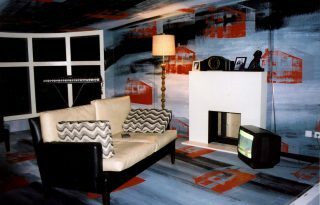 We designed the set as a replica cross section through a suburban 1950’s house. This becomes a metaphor for the mind; being trapped inside someone’s head, and inside the home. Within the set we incorporated many theatrical tricks, such as secret passages within the walls to allow characters and their doubles (dressed identically) to appear across the set. 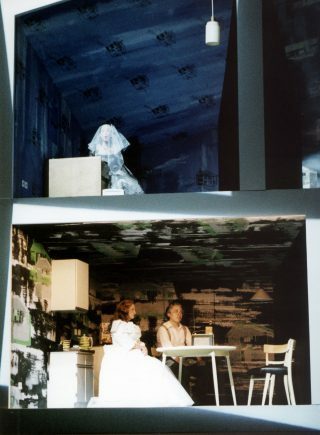 The house as a motif exists through many media and forms within the set, such as wallpaper screen-printed with photographic images of the house, and a model of the house in the attic room. Film itself becomes a central way that the story of the opera is told, describing the tension in the relationship between Auden and Stravinsky. 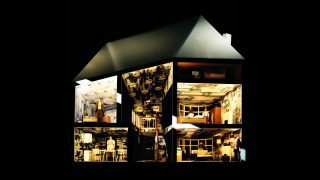 Films are projected both onto a cloth – a traditional film screen – and onto the house itself, acting also as the lighting inside the rooms, and through the windows.